My daughter recently became a Paparazzi Independent Consultant. As a consultant, she needs creative, attractive ways to store and display her jewelry pieces. I put together this DIY jewelry storage and display project for her. In my mind, this was a quick and easy project, but it proved to be more challenging than I expected. 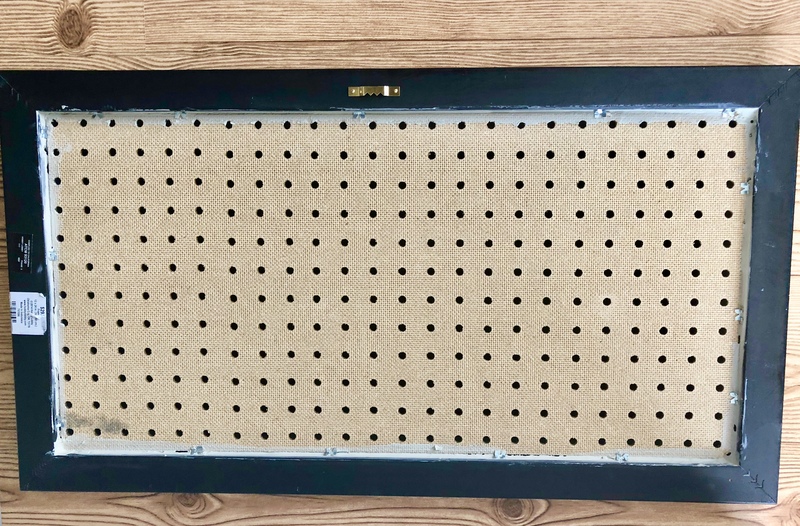 Pegboard sheet- bought mine at Home Depot $9.99 for a 4 x 2-foot sheet. Start with the frame. 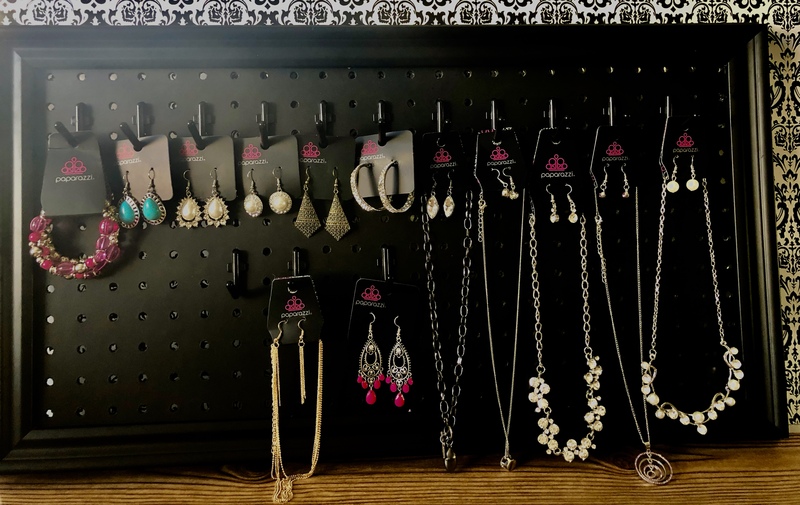 I chose a black frame because I knew I wanted to paint the pegboard black so that the hooks, pegboard, and frame would blend together in the background and really showcase the jewelry. You could also pick colors to match your decor. Home Depot can cut the pegboard sheet to fit in the frame, this is great if you are afraid of electric saws, like me. 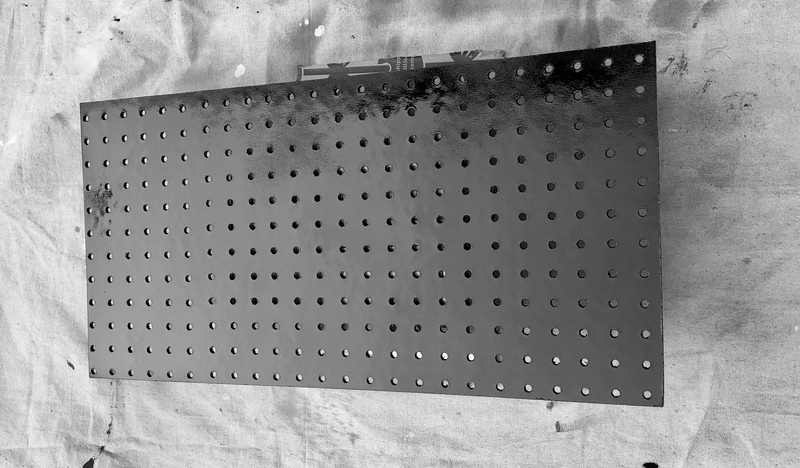 Apply two coats of paint to the pegboard. Use a drop cloth to catch overspray. Let the paint cure overnight then apply a coat of clear sealer to protect the paint from chipping when move pegs around. I planned to glue the board in place, hammer a sawtooth hanger on the back of the frame, and hang this bad boy on the wall in one afternoon. I was wrong! First, I used wood glue to attach the pegboard to the frame. The frame is not wood. 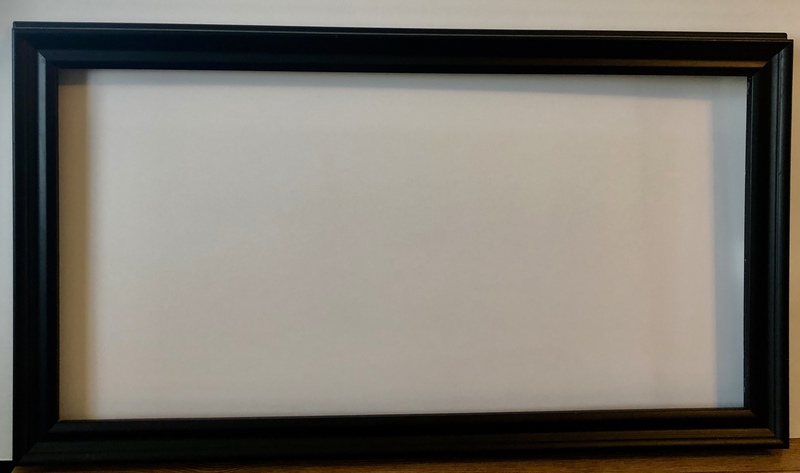 In fact, I am not sure exactly what the frame is made of. It is some kind of molded plastic-type-material. I do know it is not wood. So, the wood glue failed! My next idea was to use Gorilla glue, because that can hold anything, right? I don’t like how Gorilla glue expands as it dries and tends to ooze everywhere. So, I ordered Gorilla Glue hot glue sticks. That failed too. My last attempt before throwing in the towel was Liquid Nails. Using a caulking gun I applied Liquid Nails around the back of the frame between the peg board and the edge of the frame. I wasn’t sure how durable that would be, so I added glazier points. Amazon sales a fance tool to apply the glazier points, but I was too impatient to order it. Instead, I used a flat-head screw driver and my small jewelry hammer to tap them into place. Liquid Nails seemed to do the trick. A versatile way to store and display jewelry. I think I may attach another sawtooth hanger to the short end so the frame can be hung vertically or horizontally. Next up, different sized frames specifically for earrings and or bracelets. Functional and attractive jewelry storage and display.